How did you do this? It's very good. Galactic, i have to admit, you're a writing machine. I'm Serial Killer, my job is killing you! Cool! I will add it as screenshot since i lost almost every screenie. Do you think it is also possible to export the lamps (with light color) into the .dae file? This way I can try a night render in Blender. Export to .dae file, import in Blender and play with camera angle, light settings and render settings (like indirect light). Doesnt it already export lights? I think it does. There must be a setting for it somewhere. I remember the problem was that i didnt know how to convert GTA2 lights into "real" lights, so they might be too dim or too bright when you enable them. Just open a map and enable night mode, then export it, all lights should come with it. The editor exports them the same way as they work in GTA2; point lights. What is "planes" in means of lighting? I would need to know what to do before i do it. However, if you are experienced in 3d modeling and rendering, you could simply replace the exported file <light> tags with something else. (or what ever tag name it uses in the XML file). If you can, you could make your own profile like "blender" has there, and i can add it in the editor. By the way, how do you make textures work on blender? I cant get it load the exported maps properly anymore (shows no textures). worked with older versions. Cycles is a render engine build into the latest Blender. Works with photon path or sumthing like that, more realistic and for this it needs a plane that gives light. Point lights are not that realistic I guess. I didn't know I could edit the tags of the .dae file, thanks for telling. I'm experimenting (now) with Python and xml editing. There is also a small problem with your export. You might want to add the <blue>, <red> and <green> tag under the <technique profile="blender"> tag, because the <color> is not read (in latest Blender 2.72b). I make the texture work by selecting the object, adding a material, adding a texture and select as type the image. As mapping I use UV and for alpha enable it on texture tab and go under material and set transparency on and alpha to 0. How can you create a point light with planes? Sounds quite odd to my ears. Are you sure about that? Damn, i think i had those tags before but removed them because i realised i dont need them. It was supposed to work automatically without any clicks in blender, at least it worked before... Do you have any idea how to fix it in the XML? Well, with a plane as a light source, it's not really a point light any more... I'm not sure if I will use planes eventually, I'm just experimenting. You can keep the export to point lights. When I open 'Epic dae' files I get all white lights, when I save a coloured light in Blender as .dae and re-open it, I do get the coloured light and the difference in the xml is the red,green,blue tag. I don't know how to fix the XML to get alpha working. I tried an export with Blender to .dae with correct settings, but I could not find a difference with the epic dae. Oh, i will add those then, some time. So after you opened that re-saved dae, it didnt display texture automatically? Wait. The epic .dae does show the texture, that part works. However the alpha settings are not correct. I tried to recreate an .dae (with correct alpha), but it fails. Just ignore this texture-complain from me, if you can update the lights to have correct colour I'm already happy. Can you show me the correct .dae tags/specification for the colors, basically just paste the whole <light> tag, so i can add it in the editor as it is in there made by blender. With x,y,z a value between 0 and 1. Wow nice, love the second one! Adding it to first post. That second screen reminds me of Sim City in a way, i like it! Old School GTA2 Mapper and Scripter. Creator of the original GTA2 Scripting tutorials hosted by Ben Millard. According to the retval 2, the file could not be opened for writing. Check if your folder has write permissions for new files from your user account. And also check that the filename was valid filename for your platform (Windows 8?). That map seems more dangerous in 3D. Here's the small program I wrote to read the player xyza from GTA2 and write it to your editor. It's only compatible with 0.6.6602. My horrible C++ source code included. Start the map editor first, open a map, change camera to a similar view to the video or load my camera.dat file, open GTA2 on the same map and then run gta2xyz.exe. It needs to be run as admin but this might change in the future if it's turned into a DLL. 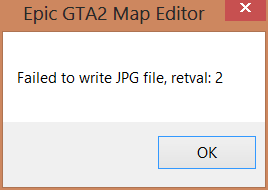 Is it possible to start Epic GTA2 Map Editor with most of the windows turned off and camera set to a specific view? If there's no setting for it then it would be great if you could add it. I don't know if I've said it before but your editor is amazing, so many features, so much work and it runs really fast. We'll have to talk about the best way our apps can communicate or how I should fix my code so you can actually use it. I recorded the video again with better coordinates and infinite water.